Teens Dream Video Competition | Teens Dream Co Lab is a collaborative of teens and adults who encourage teens globally to be change agents in their communities, and the world! The Teens Dream Video Competition is Over – Winners Announced late March on our Website! Think about your submission for next Fall! Any Teen Globally Can Win up to $500! 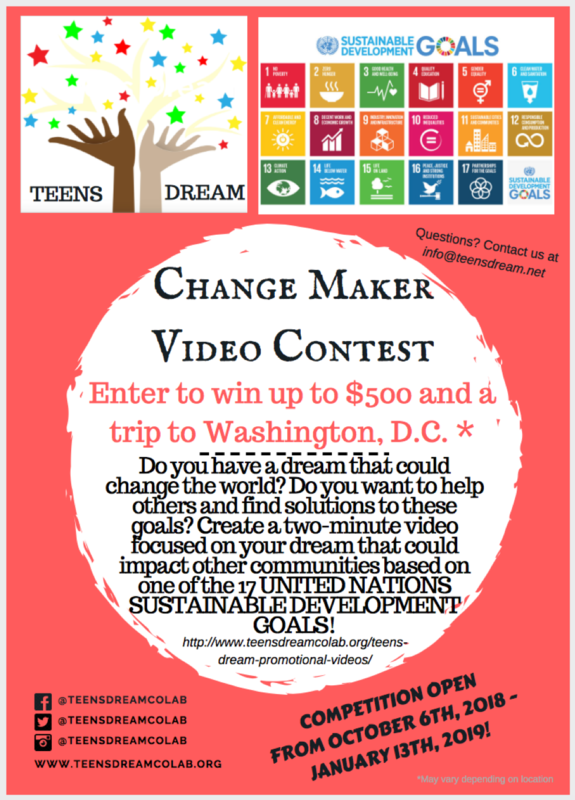 Upload your 2 min or less Dream Video as it relates to one of the United Nations Sustainable Development Goals (SDGs)! Please read the contest rules here, and familiarize yourself with the Sustainable Development Goals (SDGs) here . Make sure to read the judging rubric here . If you need help with your video submission, consider asking a teen for advice here! Teens are honored with a celebration in Washington DC, given a mentor and the chance to lead virtual Dream Hubs – all with a focus on their actions around the United Nations Sustainable Development Goals! Prior submissions and winners of the four annual Teens Dream Video Competitions are on our Gallery here, along with a map of their location! Finally, sign up for our newsletter to stay abreast of activities!